It goes without saying that Frank Sinatra could have enlisted the services of any accompanist he wanted. 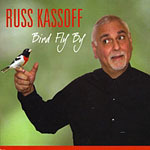 The fact that he chose Russ Kassoff speaks volumes about Kassoff's unequivocal artistry, which is splendidly showcased on Somewhere, Kassoff's first album as leader of his own group (after almost forty years as a professional musician). Kassoff, whose natural sense of rhythm, fluent touch and scrupulous attention to dynamics are above reproach, plays unaccompanied on five selections, with bassist Martin Wind on one ("You Are All the World to Me ), with Wind and drummer Tim Horner on the remaining half-dozen. He also has a keen ear for a charming melody, an impression borne out by the inclusion of such undervalued treasures as "Look for the Silver Lining, "Somewhere, "It Only Happens When I Dance with You, "The Best Thing for You and "It Never Entered My Mind. Completing the captivating program are the Gershwins' "Lady Be Good, Ellington's "Love You Madly, Pete Seeger's "Where Have All the Flowers Gone and four of Kassoff's original compositions, three of which were co-written with lyricist Deirdre Broderick (but not sung here). Even though Kassoff is the unmistakable headliner, sharing the stage with colleagues as sharp and productive as Wind and Horner certainly doesn't damage the cause. Horner is a resourceful drummer, Wind an unerring timekeeper, and the numbers on which they are included sparkle from start to finish. But Kassoff's no slouch when left to his own devices, as he shows clearly on "It Only Happens, "I Remember, "Love You Madly, "It Never Entered My Mind and "Flowers. In sum, lovely and often inspired piano work by a gentleman who definitely knows his way around the keyboard. Pristine sound and generous playing time heighten the pleasure. Recommended to those who appreciate uncommon talent nourished by uniformly good taste. Track Listing: Look for the Silver Lining; Somewhere; It Only Happens When I Dance with You; A Sackets Sunset; The Best Thing for You; You Are All the World to Me; Samba du Sackets; I Remember; Love You Madly; It Never Entered My Mind; Oh, Lady Be Good; Where Have All the Flowers Gone (70:46). 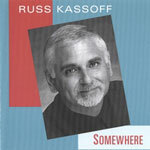 Personnel: Russ Kassoff: piano; Martin Wind: bass (1,2,4-7,11); Tim Horner: drums (1,2,4,5,7,11).